“Don’t judge a book by its cover” is a phrase that is well known by all and can easily be applied to pastures. While some pastures may look harmless at a glance, potential toxins could be residing in the plants that can negatively impact livestock production. “What would you do if you found out that there was a poison hiding somewhere in your pastures?” poses Dennis Hancock, professor and extension forage agronomist at the University of Georgia (UGA), at the start of an article published by UGA Extension. “You know what you’d do; you would get rid of that poison,” he states. This poison is present in the form of ergot alkaloids that are produced by a fungus, known as an endophyte, which is present in certain varieties of tall fescue. The ergot affects an animal’s endocrine system, leading to constricted blood flow. Constricted blood flow isn’t the only symptom that comes from ergot alkaloids. Animals with fescue toxicosis may exhibit a plethora of different ailments. While the list of symptoms is rather extensive, some of the most problematic include high body temperature, failure to shed winter hair coat, reduced feed intake, poor weight gain, calving difficulty, and low pregnancy rates. “Combined, the effects of these toxins are estimated to cost U.S. beef producers nearly $2 billion annually,” Hancock discloses. To show just how much an animal’s performance is reduced by toxic tall fescue, cow-calf herds grazing this forage produce 30 percent fewer calves. The calves that are produced will likely be 60 to 90 pounds lighter than their counterparts not exposed to toxic tall fescue. The effects of ergot alkaloids carry on even after cattle leave the pasture. “In a Georgia study, calves that had been backgrounded on toxic tall fescue were approximately 100 pounds lighter than similar calves on nontoxic tall fescue when they were shipped to a feedlot, and they stayed approximately 100 pounds lighter until they were harvested nearly 120 days later,” Hancock explains. Even though tall fescue takes a hard rap with its toxicity issues, it still has many great agronomic characteristics. 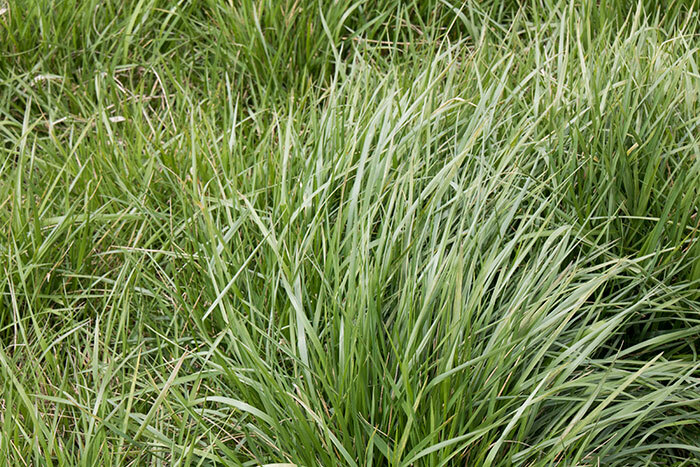 Tall fescue’s high yields and forage quality, as well as grazing resilience and late-fall productivity, is what made it popular in the first place. “Researchers first tried killing out the endophyte,” Hancock starts. “The resulting endophyte-free tall fescue solved the animal performance problem, but the stand tended to die out within a couple years,” he adds. The researchers concluded that the endophyte creates other compounds that lead to drought and pest tolerance, which allows the plant to survive harsh growing conditions. Thanks to work done in the mid-1990s, nontoxic endophyte tall fescue varieties are available today that don’t cause animal health issues while still being drought and pest tolerant. The struggle with tall fescue started in the 1940s and 1950s with an educational push for soil conservation. Farmers were encouraged to plant more pasture instead of tilling soil. The solution to the issue was often toxic Kentucky 31 tall fescue. The realization that the endophyte was the cause of many production problems came 30 to 40 years later. Now is the time for another educational push. “The next chapter in the saga of tall fescue must include organizations and incentives that help producers take steps to convert these toxic fields into stands of nontoxic endophyte tall fescue,” Hancock concludes. A big part of the current effort involves the Alliance for Grassland Renewal. This partnership of university specialists, government agencies, and private sector companies has a mission to both educate and advance incentive programs that will move producers to transition from their toxic tall fescue acres. Growers are encouraged to attend a tall fescue renovation workshop in 2019, which will be held in six different Fescue Belt states.